Whites metal detectors are the result of an unwavering commitment to designing and selling only the best metal detectors available. 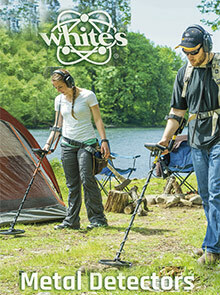 Check out their selection for dry land, in-water and beach metal detecting, and you'll see that a Whites metal detector stands out from all the rest. They're designed to help you quickly sort out the treasures from the junk, saving you valuable search time -- an essential feature for water and beach metal detecting.